An Artist from Kenya – What will matter in a hundred years? On Thanksgiving of 2014, we had a group of Kenyans over for dinner. Kennedy Mbugua Waireri was one of the guest. He was engaged in the gathering as one of the quieter people there, which was not too much out of the ordinary for him. We have several of his paintings on our wall, and several printed cloths he framed/mounted for us. Over the first weekend of March, 2015, all alone in his apartment in Vinings, Georgia, Kennedy killed himself with a gun. His body was found Monday, March 2, 2015. Below, I reproduce part of an article about Kennedy published by “shady p” in August of 2012. 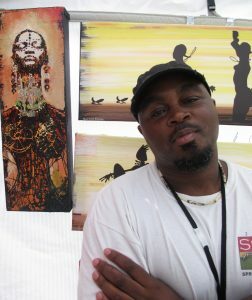 Kenya born artist, Kennedy Waireri, is inspired by African traditions and his transatlantic experience. His painted and printed works range from African imagery to Black celebrity figures on canvas. His Maasai warriors and Tuareg Woman draw from his exposure to indigenous cultures of Africa, while his celebrity iconography reflects his exposure to popular culture and media. Jay-Z before of a NY cityscape and Jimi Hendrix in abstract form were popular pieces in his presentation. Mr. Waireri explains the origin of the art inspired by Africa as a fascinating revelation. The BEAUTY of these people and their practices only revealed itself to him AFTER returning to Kenya from living in the US for some time. From then, African iconography proliferated in his work. Why? Why does beauty appear to us once our perspective changes? Are we incapable of conceiving beauty in ourselves without the â€œhelpâ€ of society? Does the social construction of beauty and idealization problematize the actual perception of beauty in us and others? How do we become mirrors to ourselves so that we may recognize our beauty? Kennedyâ€™s embrace of his oversaturated visual index of African imagery as a reaction to Western culture was the construction of a mirror, but would he have been able to see this beauty had he never traveled to The States? Does the melting pot of the world produce mirrors or is it the disruption of our social norms and ideals that offer opportunities of introspection and reflection? Is this â€œappreciationâ€ a mere capitalization on the exotic-ization of indigenous cultures or the beautification of a people through the presentation and exposure of traditional practices and cultures. Afterall, â€œAll Art is Propagandaâ€ and this one is especially beautiful.